The second book of Tales of Ancient Rome intertwines the stories of three women to again create a fascinating novel of love and war, richly steeped in history. There is an intriguing hiatus between the previous novel in this series, The Wedding Shroud, and The Golden Dice. At the end of The Wedding Shroud we leave Caecilia holding her husband Vel’s dice with a momentuous decision to be made, and it is only with the first few lines of The Golden Dice that we realise what that decision was. She is no longer a stubborn and conflicted teenaged Roman, married off to a powerful Etruscan noble to ensure Rome’s access to food supplies, but a loving, proud wife and mother of three sons. She is no longer horrified by the mores of the city of Veii or the freedom given to woman. She relishes them – up to a point. She could not move away from him, arms tightening around his waist, not trusting that he had returned, that another year had passed and he had not been killed. As well, she is the focus of dislike and criticism. As a Roman she has not been fully accepted by the Etruscan elite and she is bitterly hated by her relatives and other powerful patricians back in Rome, who see her return to Veii as a betrayal. The dice are a symbol of the love between Vel and Caecilia but they also emphasise the idea that a fortunate life in this period was very dependent on luck. 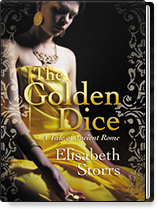 In The Golden Dice we see the effects of continuing warfare on both Veii and Rome and we see them through the eyes of some vivid new characters who have certainly not been lucky, and whose roles in society give insights into everyday life. Their stories also illuminate the vicissitudes of being female in male-dominated tribal societies. For her winter brought a special cruelty. The wind was bitter and the cold seeped from the earth to chill the marrow. Her clothes were sodden: fingers icy and painful from chilblains, lips blue and ringed with sores. Semni, a potter who can no longer make luxury pots because of the war restrictions in Veii, gets a position in Caecilia’s household. She is a self-serving but vibrant girl who plays an important role in thwarting the venomous plans of Artile Mastarna, Vel’s soothsayer brother. Elizabeth Storrs is an extremely skilful writer. Good historical fiction is extremely difficult to write – such novels attempt to portray a world that doesn’t exist and the writer has to exercise as much imagination in creating a ‘real’ environment as Tolkien, say, needed to do when writing fantasy. The reality of historical times is simply not there to be taken for granted, unlike in novels set in the world of today. By intertwining the lives of the three women so cleverly this writer has created a satisfyingly rich sense of the harsh life of the period. Caecilia surveyed the bleak winter landscape. Once the woods had been dense with shimmering summer green, or the autumn blanket of russet and purple. Harvested for its timber by the Romans, the forest was growing sparser and sparser, raw stumps instead of the stark silhouettes of winter. Two other aspects of Storrs’s writing make this book such a satisfying read. One is the masterly way that exposition of the political machinations of Rome and Veii is embedded in conversations that ring with truth. The other is the breathtaking amount of research. Etruscan history is fairly elusive but Storrs has soaked herself in it to a marked degree – not that the research is obvious in her work; it is more like a very rich and nourishing soup that bathes the whole narrative. There are maps and an index of words as well as titles of books that informed Storrs’s research. A great deal of practical information is made available to us. I was amazed by the fact that Veii and Rome were only 12 miles apart across the Tiber. Indeed, the novel has prompted me to think of many aspects of the times; things like hand-to-hand fighting, the notion of an enemy so close by, the fragility of life. This is a stimulating and clever novel and it is very pleasing to know that The Call to Juno, a third volume in the series, is currently being written.